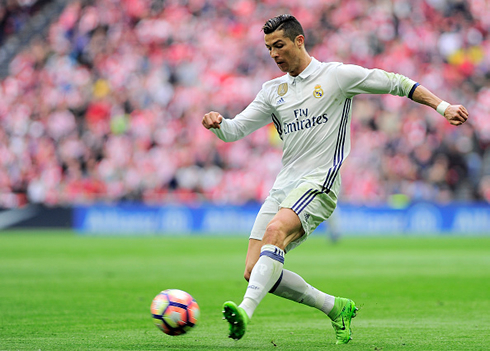 Real Madrid made a firm step towards La Liga title this Saturday afternoon, after beating Athletic Bilbao 2-1 at the new San Mamés stadium. Benzema with the opening goal in the first half and Casemiro later in the second secured the important 3 points for the Merengues. How many places can Casemiro be at once? As Athletic Club learned today - he can be everywhere. The Brazilian midfielder was brilliant today, breaking up everything in the midfield and even scoring the match-winner in the second half. Thanks to Casemiro, Real Madrid were able to hold onto a 2-1 victory over the side from Bilbao, after a hard-fought match at the San Mamés. 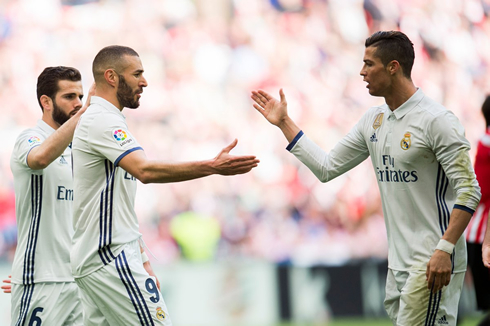 Earlier in the first half, Karim Benzema had already given the Merengues the lead, after a great assist by Cristiano Ronaldo. It's now a 5-point lead over Barcelona in the second place and only 11 games left for the finish line! With the BBC starting up top, Madrid were almost at full strength today. The only change from the ideal first 11 was Nacho, deputizing at the back alongside Sergio Ramos. There was something different about this team though from the beginning of the game. Athletic Club did start with more enthusiasm, but soon Madrid settled and began playing some excellent football. Quick passing, nice interplay and surprisingly, no reliance on crossing. Karim Benzema was absolutely brilliant today. The Frenchman was everywhere - even tracking back to help out the defense at times. And in attack, he would be rewarded with a goal after a nice ball from Cristiano Ronaldo. Casemiro started the move with a long ball to CR7, who expertly played Benzema in and he would make no mistake. Real Madrid continued to play well, even spurning a couple more chances to put the game away. And they were almost made to pay for it in the second half, when Aritz Aduriz scored from a header. But Madrid, recovered almost immediately as Ronaldo's flick on in the box from a corner fell to the feet of Casemiro. The Brazilian was calm in front of goal and finished well. Ronaldo didn't get on the scoresheet today, but his two assists were vital. 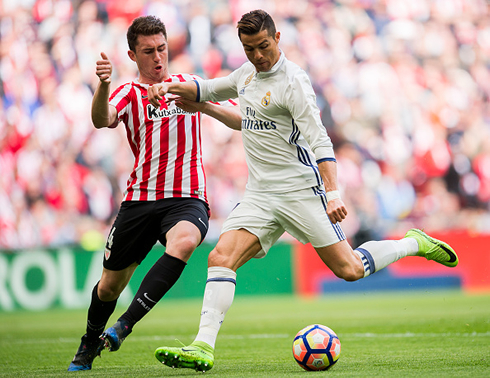 Athletic would continue to push forward, but with Bale and Benzema helping out in defense, their threat was neutralized. This is likely the most difficult away match left this season, so it's a good sign that Madrid did so well. Next month is going to decide the season, so Madrid must remain focused and fresh. Nevertheless, this was a great result against a tough opponent! Cristiano Ronaldo next game is a 2018 World Cup fixture, on March 25 of 2017 against Hungary. You can watch Juventus live stream, Portugal vs Hungary, Barcelona vs Valencia, Middlesbrough vs Manchester United, Tottenham vs Southampton, and Manchester City vs Liverpool, all matches provided from our soccer live game pages.